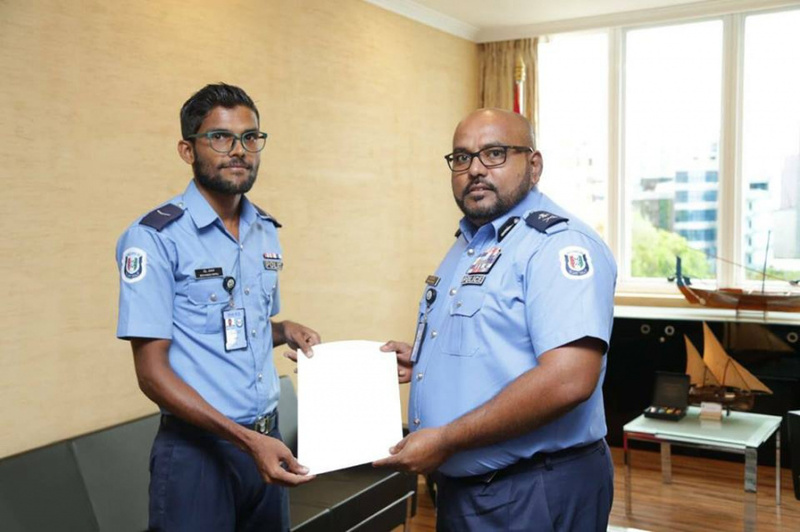 Maldives Police Service has honored Lance Corporal Mohamed Rifau for his efforts to help save the life of a young boy. Fathimath Shifna Mohamed was taking her four-year-old son who was suffering from seizures to ADK Hospital on Monday evening when she got stuck in traffic. Officer Rifau extended his assistant and carried the boy to the hospital on his shoulders. Acting Commissioner of Police, DCP Abdulla Nawaz met with Rifau and commended him on his bravery and kindness this Wednesday. The meeting was held at the Shaheed Hussain Adam Building, where Rifau was presented with a certificate of appreciation by Nawaz. The commendation follows an outpouring of support and praise for Rifau’s actions by ordinary citizens. Shifna, whose son the officer helped save, says the young boy is now doing well.